The demo for Strange Brigade at E3 had a lot of flare to it. There was an entire meeting room dedicated to the event, and it was decked out to feel like an ancient tomb with fake gold, chests, and plastic gems scattered about. The game itself is an action third-person shooter with a 1930s theme to it, and you get to fight mummies, ghouls, and giant monsters alike. I tried out Strange Brigade for the Xbox One, and I even got to play with one of the developers. To open up, there are four characters to choose from right now, and each has a unique weapon set as well as a special move. While getting used to console controls was a little hard at first (since I mainly play on PC), it only took a few minutes to get acclimated with everything. To start out, the two of us started out in a cave where we were given some supplies. After using some magic to open up a pathway, we were attacked by ancient zombies. While in combat, you have one main weapon and a side arm to attack with, a melee attack that will knock back enemies to give you space, a roll to quickly get out of danger, and a special move that can turn the tides of battle. While combat was hectic at first, I was taught to use melee when an enemy got too close, and to also roll out of danger when there was a hazard thrown my way or there were to many enemies surrounding me. Also, upon killing an enemy, you are rewarded gold on a kill, and enemies drop these little glowing spirits that charge up your special meter. During my first encounter, I was roughed up pretty bad, so I was dropped a health potion. Moving on, I was shown that there are a bunch of little hidden secrets scattered throughout the level. These were in the form of health, ammo, gems (which are used to upgrade your arsenal) and hidden pathways that can take you on an alternate level route. Once we activated the secret to go through a secret route, we were taken to a campsite, which acts as checkpoints in levels. While at a campsite, you can heal up, purchase new weapons, refill your ammo, and upgrade your weapons. The demo had me in possession of a few gems already, but I decided to go with the ability to shoot and reload faster as well as an upgrade that would make bullets bounce between enemies to cause additional damage. Moving on to the next area, we were overrun with more zombies, and I had filled up my special meter, so I unleashed an area attack that burned all of the enemies to a crisp. This felt amazing to do, and it really does help when you are being overrun with enemies and need to quickly dispatch them. As the fight raged on, I was instructed to hold the fire button down while I was not aiming, and once I did that, I was able to bring the souls of my fallen enemies to me rather than running up to collect them. This made charging up my special move a lot more convenient. In the next area, a new enemy type was introduced, mummies. These were a lot harder to kill than the zombies that the developer and I had fought earlier, and these enemies also launched ground attacks at you. We both ended up getting low on health, and what was interested was that there are actually two health bars. Your first, blue health bar did not regenerate, and you could only restore that bar with a potion. The next bar is significantly smaller, but that one regenerates, albeit slowly. This was an interesting design choice as usually games have a small, rechargeable health pool and then a big health pool underneath. As we continued to battle, we used our special moves, trying to survive the onslaught. The developer then activated various world hazards by shooting at them, such as a giant rotating blade, and a mound of rocks that would crush enemies. Unfortunately, the developer got overrun and ended up dying, and since there is no downed system in the game, I was left to fend for myself. I barely made it through the counter, and I found a sarcophagus that I used to revive my comrade. In the final area of the demo, a new enemy arose to stop us in our tracks, ghouls. These enemies would teleport around the area and quickly charge is to try and ambush us. At this point in the demo, there were an astounding amount of enemies on screen. Since there were so many enemies to fight, I ended up running out of ammo. While side arms have unlimited ammo, they are relatively weak and must be reloaded often. As things started to get bleak, I realized that I could melee an enemy down and finish them off while they are on the ground. This sometimes, but not always, rewards you with ammo, but it felt like a good way to mix up combat and encourage the use of both shooting and melee. As the the encounter came to a close, a giant monster crushed one last remaining enemy, and a side shot of the monster’s foot was only in view. After this, the demo promptly ended. I can only assume that whatever that creature was was the boss for the level. Throughout the demo, there were voiced bits of a narrator that would use that old, transatlantic accent that old-time films are known for. In addition, there would be little parts that would cut to black and white with film grain, have the narrator announce an enemy, and a silly little title of the enemy would pop up. Some might find it tacky or cliche, but it really did add a silly tone to the game and gave it more of a 1930s feel. The combat, as stated before, felt pretty good, and I wanted to mess around with the other characters and their unique abilities. With many different ways to upgrade your weapons, utilize your abilities, and secrets scattered throughout the level, it also made me want to go back and see what other secrets were left waiting for me to find. As a side note, the game runs on the Azure engine, which is an in-house engine created specifically for this game. It it unknown if Rebellion will use this engine for any other future titles, but for now, the engine runs smooth most of the time. There were only a couple awkward moments or movements, but those can easily be chalked up to the game still being in beta. 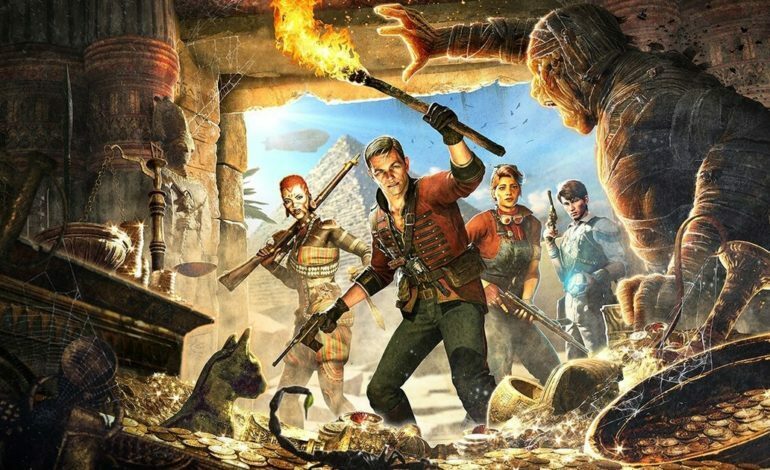 Strange Brigade will launch for Xbox One, PlayStation 4, and PC on August 28, 2018. The game will also have enhanced features for the Xbox One X and PlayStation 4 Pro.